The Grounds and Landscape Services Team strives to support the educational mission of the College while providing a pleasant and relaxing atmosphere to enhance the learning environment. The Princeton Review recently ranked Rollins’ campus the most beautiful in the country. Why? Explore some of our team's hard work. 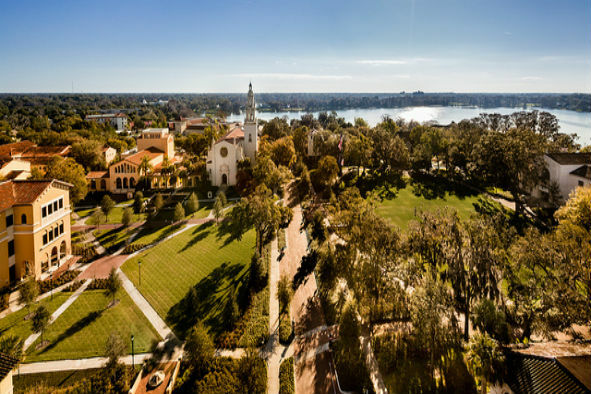 The Grounds and Landscape Services Team operates by promoting ethical practices that enhance the integrity, quality, and values of the Rollins College mission and its goals. Great pride is taken in preserving the natural historic landscape while integrating current flora to provide a creative balance between the old and new. While the campus has experienced growth and transformation along its road to recognition as one of the country’s top liberal art college as well as the most beautiful campus on the nation, one goal has remained consistent: providing a quality education in a landscape that will continue to flourish for future generations. The Grounds and Landscape Services Team consists of a devoted group of landscape professionals who are responsible for daily maintenance of the campus. As stewards of the campus, our team endeavors to provide a safe and attractive outdoor environment that enhances the learning and working experience at Rollins College.